14 dogs reported to Crufts Ring 36 this afternoon to be pre-judged for the Kennel Club’s Vulnerable British & Irish Breed Competition. The purpose of the competition is to raise awareness of those British and Irish dog breeds which are considered to be Vulnerable, ie which registered less than 300 puppies/imports with the Kennel Club in the previous calendar year. It is also to recognise the people who are dedicated to their survival and prosperity. 28 breeds were classed as Vulnerable in 2018, based on their 2017 registration figured. Each of the dogs qualified for the Crufts 2019 final by winning Best of Breed at a designated championship show for their respective Group during 2018. Although one dog in each breed was selected, attendance to be considered for the final was optional. 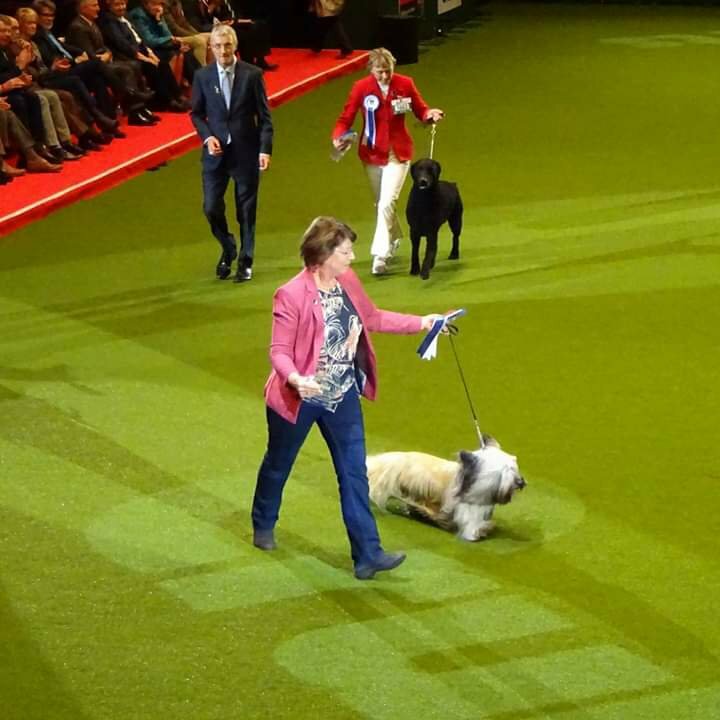 The winner, announced in the Main Arena this evening at 7:15pm, was the Skye Terrier – CH BRAKEMILL BARNUM ShCM. Reserve was the Curly Coated Retriever.